In earlier centuries some diseases were untreatable and where they were believed to be communicable the standard practice was to isolate those who were infected. In medieval times leprosy was common enough. it is essentially a bacterial infection of the nasal passages but untreated leads to skin and nerve conditions which get progressively worse. 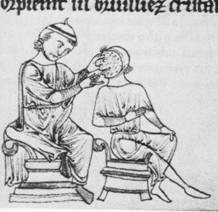 The majority of people are immune to leprosy but those unfortunates who cannot combat the bacterium had no choice in the Middle Ages but to accept their fate. There was a Leper House in Stratford but its exact location is not known. there is certainly a reference to a leper hospital in 1257 dedicated to St John the Baptist “without Stony Stratford.” In there are further ear1265 a grant of timber (presumably for building purposes) was made to the “brethren of the hospital of St. John, Stony Stratford.” There are further 13th and early 14th century references and it appears from a 1352 reference that it had a chapel attached to it. With no further references after this date it can be inferred that the Black Death decimated the hospital population and it was no longer able to continue. As I said, the exact location is not known. “Without Stony Stratford” can be interpreted as at the north end, on or near the causeway, or, as some have suggested, old Stratford. In the 19th century there was a field in Old Stratford known as Chapel Close, which may be a clue. The 17th century was affected by serious outbreaks of “plague”. The precise disease is uncertain but the infection was communicable and deadly. Outbreaks were recorded in 1625, 1641 and 1647 but curiously not in 1665 which was the great plague year. In 1625 113 people, mostly on the Wolverton side died in October. One Richard martin, as an example, lost his wife, servant, and six children. he succumbed to the next visitation in 1641. Whole families were wiped out. The 1641 plague caused 102 deaths and its return in 1647 caused 43 deaths. Plague visitations were swift and deadly so there was probably never time to put people in isolation. However, there was a building on Horn Lane (now Mill Lane) that was known as the Pest House. It was said in the 19th century that it was used a a hospital at the time of the 17th century plagues, but this is doubted.The only entries in the Parish Records concerning this place refer to instances of smallpox. The building apparently collapsed suddenly in 1895.